More Downpours in the U.S.
Harvey and Irma have brought devastating floods to Texas and Florida, while severe to exceptional drought has contributed to wildfires in Montana and the Pacific Northwest. 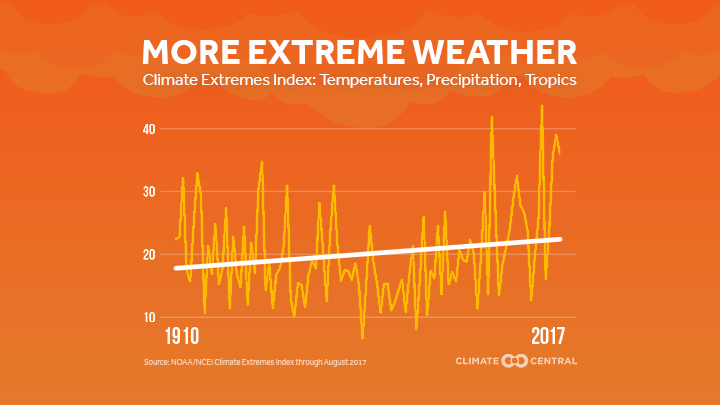 These types of weather and climate extremes are trending upward, as indicated by the NCEI Climate Extremes Index. In addition to accounting for drought and hurricane winds, the index considers temperature and precipitation extremes in the U.S. The index dates back to 1910, and the four highest values of this annual index have all come in the last 20 years. Three of the top four have come since 2010. Flooding both from coastal surge and heavy precipitation has been catastrophic from Harvey and Irma. Each storm will cost billions of dollars and take years to recover from. For Irma, storm surge and coastal flooding have been some of the biggest drivers of damage. The flooding has gotten a boost from climate change, specifically sea level rise. Warming oceans and melting land ice have caused oceans to rise about seven inches since 1900, which has also led to more frequent coastal flooding. In addition, the warmer atmosphere leads to more evaporation, meaning more water available for precipitation. 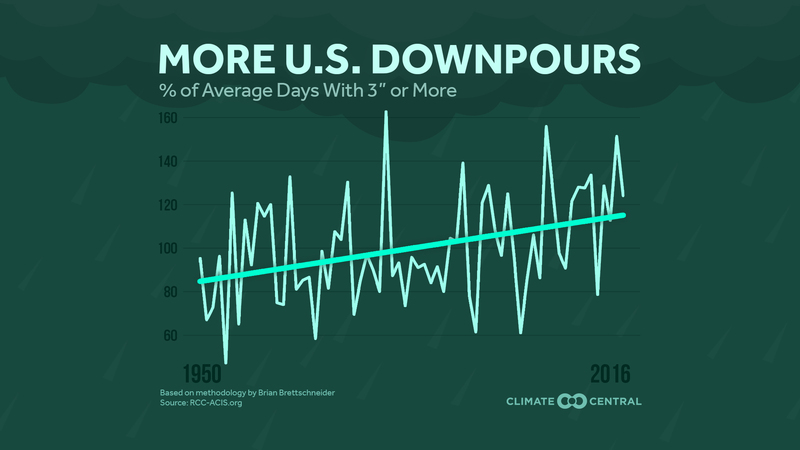 That can lead to extreme rainfall totals like Harvey’s, and has made the number of days each year in the U.S. with more than two inches and three inches of rain more common. At the other end of the spectrum, drought and sweltering heat from the Northern Plains to the Pacific Northwest have pushed the Climate Extremes Index even higher. That’s because the index includes temperatures extremes as well as their impacts. 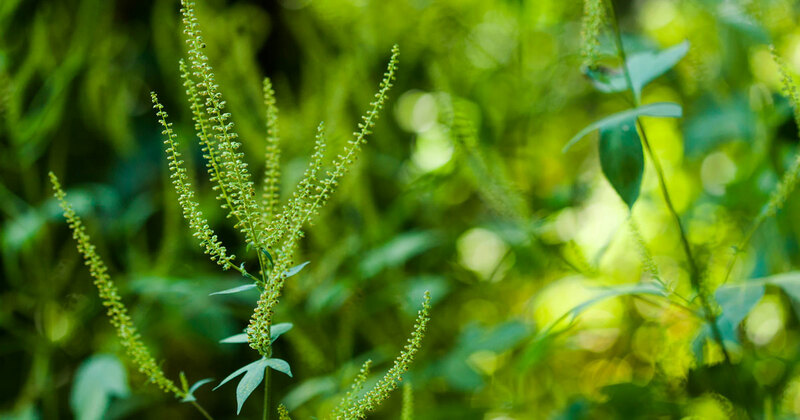 In this case, the high heat and dry conditions have fueled a brutal wildfire season. More than 400,000 acres are currently burning in Montana alone, which just finished its second driest month on record. 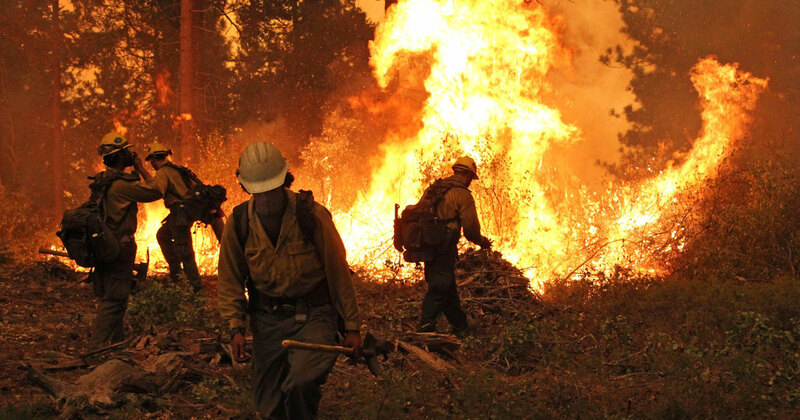 Fires are also raging in Idaho, Oregon, and Washington. Each of those states is battling its own 100,000-acre blaze right now as well. Smoke from those fires has traveled vast distances, bringing hazy skies and poorer air quality to the Plains and parts of the eastern U.S. Rising temperatures have contributed to lengthening wildfire season by 105 days since 1970 and an uptick in large wildfires. Climate change has also tipped the odds toward more extreme heat. 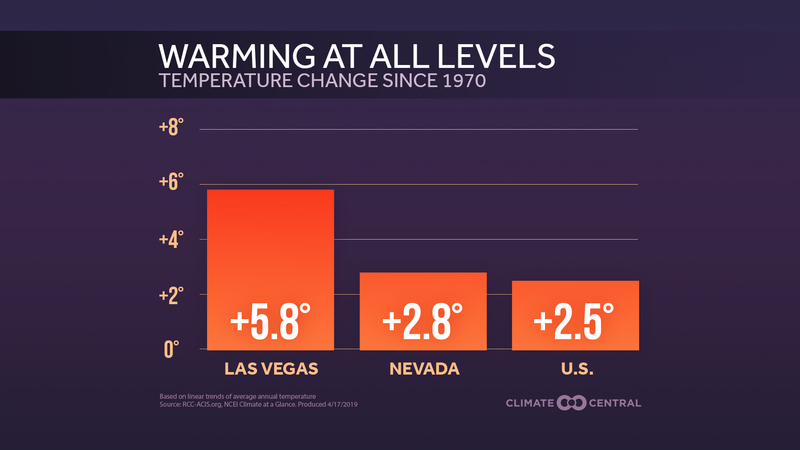 Record highs have been outpacing record lows with each passing decade. Since 2015, the number of daily record high temperature in the U.S. has outnumbered the number of daily record lows by more than 3-to-1. One prime example came earlier this month, when San Francisco had its all time record high reaching 106°F on Sept. 1.